On September 3, the Church will celebrate the feast of Pope St. Pius X, that heroically virtuous pontiff who tried to extirpate the Modernist heretics from the hierarchy. 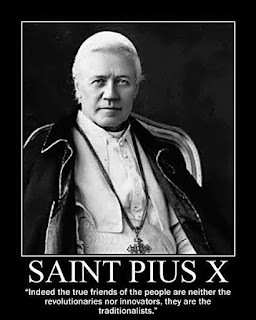 St. Pius X was the first pope to be canonized (on May 29, 1954 by Pope Pius XII) since Pope St. Pius V in 1712 (by Pope Clement XVI). On October 11, the Vatican II sect will celebrate the feast of "Pope Saint" John XXIII (Angelo Roncalli), the Modernist heretic responsible for the Great Apostasy. Antipope John was "canonized" by Jorge Bergoglio (Antipope Francis) on April 27, 2014 along with Antipope John Paul II (Karol Wotyla) as a way of thanking them for undoing all that Pope Pius X accomplished and for setting up Counterfeit Catholicism. In this post, I wish to compare/contrast Rocalli (John XXIII) and St. Pius X. The differences between whom the Catholic Church venerates and whom the Vatican II sect venerates couldn't make it any more clear that they are not one and the same entity as Vatican II apologists would like you to believe. Pope Benedict XIV (1740-1758), says that "When inquiry is instituted for the purpose of beatification or canonization, no examination is made of miracles until after the heroic virtues or the martyrdom of the servant of God have been proved. These virtues are the first and most decisive witness to sanctity; visions, prophecies, and miracles are only of secondary importance, and they are absolutely ignored if proof of heroic virtues is not forthcoming." With this in mind let's examine two very different lives. His concern about the holiness of the clergy, the key to renewing all things in Christ, according to his motto. The renewal of ecclesiastical studies. Pius X exhorts Christian philosophers to defend the truth under the banner of St. Thomas Aquinas--using Neo-Scholastic Thomism. He founded the Pontifical Biblical Institute, and encouraged the theological sciences. His preoccupation with the eternal salvation of souls. If Pius X desired a holy clergy, it was with a view to the instruction of the faithful, to whom he gave a catechism designed for both adults and children. To the young he was truly the Pope of the Eucharist, promoting Holy Communion at an early age, and for everyone, frequent (and if possible) daily Communion. The defense of the faith in its fullness and purity. The false teachings that became the "synthesis of all heresies" was labeled as Modernism, and wisely repressed in the encyclical Pascendi of September 8, 1907. In these circumstances, as well as in his battle against the Masonic "separation of Church and State," St. Pius X was, in the words of Pope Pius XII, an “infallible teacher of the faith”, the “fearless avenger of religion” and the “guardian of the Church’s liberty”. His love of the liturgy. The initiator of an authentic liturgical movement, Pius X renewed sacred music, but also the breviary and the calendar of feast days, so as to orient the Church decisively to liturgical beauty, splendor, and purity. Was removed from his teaching position at the Lateran University under "suspicion of Modernism." He was on a list of suspected Modernists as far back as 1925, and which list was kept at the Holy Office. Received the red hat of a cardinal from the hands of French President Vincent Auriol in 1953 at Roncalli's insistence. Auriol was a committed Socialist, of whom Roncalli said he was an "honest socialist." Pope Pius XI had stated, " No one can be, at the same time, a sincere Catholic and a true socialist." Promoted ecumenism. He ordered the words removed from the prayer of Consecration to the Sacred Heart of Jesus : "Be Thou King of all those who are still involved in the darkness of idolatry or of Islamism." He changed the Good Friday prayers so as to remove the phrase "perfidious (i.e., faithless) Jews." He further modernized the Mass, Breviary, and Calendar. In his encyclical Pacem In Terris (1963), he stated in paragraph #11, "Also among man's rights is that of being able to worship God in accordance with the right dictates of his own conscience, and to profess his religion both in private and in public." This is blatant heresy. Although the Vatican II sect did not begin until 1964 with the promulgation of Lumen Gentium by Antipope Paul VI, we can be morally certain Roncalli was not pope from at least this date. His encyclical clearly repudiates the teachings of all previous popes, most especially Popes Gregory XVI and Pius IX: "Now we arrive at another cause of the evils with which we suffer at seeing the Church afflicted at this moment, to wit, this “indifferentism,” or this perverse opinion spread everywhere by the devious action of bad men. According to it, one could achieve eternal salvation by any profession of faith, as long as the customs are upright and honest. It will not be difficult for you, in such a clear and evident matter, to drive so fatal an error from the midst of the peoples under your care. Indeed, since the Apostle had warned us that “there is but one God, one faith, one baptism” (Eph 4:5), those who believe that all religions offer the means to reach eternal salvation must fear and comprehend that, according to the testimony of the Savior Himself, “those who are not with Christ are against Him” (Luke 11:23); and that they scatter in sadness, since they do not gather with Him. Consequently, there is no doubt that “they who do not profess the Catholic Faith and maintain it whole and inviolate will be eternally lost” … From this infected source of “indifferentism” flows that absurd and erroneous maxim, or rather this delirium, that it is necessary to grant everyone “freedom of conscience.” This most pernicious error has its way prepared by a full and immoderate freedom of opinion that is widely spread for the ruin of religious and civil society. Some repeat with extreme impudence that it brings an advantage for religion. However, St. Augustine asked: “What could be a worse evil for the soul than the liberty of error?”"--Pope Gregory XVI, Mirari Vos (1832)--Emphasis mine. He was publicly praised by the Masonic Lodges for promoting ecumenism. Now ask yourself, "How can these two men who believed contradictory things both be true saints?" From our beliefs, our actions flow. St. Pius X wanted to "restore all things in Christ." Roncalli wanted to "open the windows of the Church" to let in the polluted air and stench of Modernism. Truth is eternal and immutable. If what St. Pius believed was true, good and beautiful, then what Roncalli believed was false, evil, and ugly. You must decide which is the True Saint of the One True Church of Christ, and which is a false saint of a false religion. There are only three possibilities when dealing with contradictory positions: 1. St. Pius is right and a saint. Traditionalism is true. 2. Roncalli is right and a saint. The Vatican II sect is true. The Church of Christ did not exist prior to this time. 3. Both are false and neither is a saint. You must reject Christianity outright and become an apostate. What will YOU decide? I'd like to share something I read several places. Roncalli took the name of a historically recognized antipope--Baldassare Cossa--from the fifteenth century. Many of you reading this may remember the famous "similarities between Abraham Lincoln and John F. Kennedy." Both were elected 100 years apart (1860 and 1960), both had as Vice-Presidents former senators from the South named Johnson who became president after the respective assassinations, etc. Some have speculated "Kennedy was Lincoln reincarnated." We know reincarnation to be false, but the comparisons are intriguing; everybody loves a good coincidence. 4. Both died before the third session of the Council. Perhaps evil works in similar ways at times. And here, at least for me, is "the kicker": Frankie chose the opening day of Vatican II (October 11) as the "feast day" of Roncalli. That is also the birthday of my spiritual father, the late, great Fr. Gommar A. DePauw, JCD who was a peritus (i.e. theological expert) at Vatican II working to help Cardinal Ottavianni against the Modernists. He became the first Traditionalist, keeping the True Church alive publicly when he launched the Catholic Traditionalist Movement in 1964! Evil is now being celebrated on the birth of the one who would keep the Faith and start the fight. (For more on Fr. DePauw, see my post of January 19, 2013 "The First."). On the feast of Pope St. Pius X this September 3rd, let's pray to the holy pontiff that, just as the false papacy of John XXIII in the fifteenth century was crushed, so too may the Vatican II sect of the second Antipope John XXIII be destroyed and a true pope restored. Maybe then we will even see the feast of "St." John XXIII on October 11 replaced with that of "St. Gommar DePauw of Westbury!" I share your committment to the One Holy Catholic Apostolic Church handed down through a validly canonically elected pope and a validly ordained priesthood. Have you or anyone you know researched the conclave of 1914 and the death of Pope Pius X? Pope Pius X died on the 20th of August, 1914, allegedly of a "broken heart", according to the NY Times or of melancholy according to Wikipedia. Father Franz Xavier Wernz S.J., a german by birth, was the head of the Jesuits, the "black pope". He died not 24 hours before on August 19th, 1914, in the modern rendering he died of diabetes, but the NY Times did not indicate he was in poor health and again said he died "of a broken heart". Pope Pius X was known to have desperately tried to contact Emperor Franz Joseph, to no avail, as his communications were intercepted. Pope Benedict XV , the pope to follow Pius X, was neutral regarding WWI. Pope Pius X was definitely not neutral. Pius X was hurriedly buried, within 48-72 hours of his death, normal for a Jew or a Moslem, but not for a beloved Catholic pope. Within the same week, one of Pius' sisters, one of those who took care of him, also died suddenly, again of the always fatal, "broken heart". I suspect there were a half dozen other deaths of a "broken heart" occurring at that time, that we don't know about or were not recorded. Coincidentally, September 3rd, on one of the morning shows some infobabe was laying out the research justifying death diagnoses of a "broken heart". Wow, what timing. September 3rd was the day on the traditional liturgical calendar that we remember St.Pius X's feast day. It also is, I recollect, the anniversary of the election of Benedict XV. While he was pope an apostolic constitution (January 1905) governing the next conclave was written and held in secret until the death of Pius X - including the requirement that all the proceedings of the conclave discussions, before, during and after be held in secret in perpetuity by the participating cardinals. No such rule had ever been enforced on any previous conclave, probably because Catholics have an obligation before Jesus to follow a canonically elected pope. How can we do that if all the proceedings are held in secret? The freemasons operate in secrecy, but not the true Catholic Church. As you could ascertain by my rendition of the events of 1914, I'm very suspicious of official pronouncements on these deaths. These were cases which cried out for an independent objective forensic investigation. I believe Pius X was surrounded by traitors to Jesus Christ and His Church, with the exception of Cardinal Merry del Val. Mary Wessel Podlesak joesonmanassas@yahoo.com 716-225-9102. 3908 Stone Gate Blvd. Elkton MD 21921. Yeah, I want to write a book about this. I have been looking for info on John XXIII and came across this post. I accidentally came across a couple different blogs in the last 2 days regarding John XIII appearing to a Sister Caterina and healing her. The blogs are saying that this miracle alone proves that he was a true Pope. They are using this "miracle" to attack and disprove sedevacantism. I am not personally one who is big into miracles, apparitions, etc., but our Lord did preform miracles. Your comment is greatly appreciated. Thanks. There is currently no Magisterial authority to declare authentic miracles. Sometimes demons cause an illness and allow it to be "cured" to produce a false "miracle" to lead others astray. That there are people claiming "miracles" for Roncalli does not surprise me at all. There's doubts as to the first alleged "miracle" approved by the Modernist Vatican for Mother Teresa's "canonization." It involved the cure of a young Indian woman, Monica Besra, who claimed that a tumor on her ovary was cured when a medal of Mother Teresa was touched to her body where she felt pain. Dr. Ranjan Mustafi, the chief gynecologist treating her, claims that it was the four drugs to which she was responding. The Vatican never contacted Dr. Mustafi to investigate, and nevertheless claimed "there was no medical explanation" for her cure. The Roncalli miracle must be false through demonic activity or deception. We can be certain because he was a heretic and even if he somehow repented and made it to Heaven, his life is not worthy of emulation. Nevertheless, Bergoglio will lie for his antipope predecessor. This alleged miracle of John XXIII was supposed to have taken place in 1966. The Nun had 14 operations and a fistula that wouldn't heal. She said that John XXIII appeared to her in his vestments, said he had heard her and the other Nuns of the Daughters of Charity praying to him for her and then he pronounced her healed. I read that this "miracle" was not considered for his beatification. I found it interesting that this "miracle" of anti-Pope John XXIII from 1966 is being reported on various websites as a reason to disprove sedvacantism. People seem to believe in "miracles" over the Deposit of Faith. So true Joann. The alleged miracle happened in 1966, after the Great Apostasy in 1964. There was no pope to verify the so-called miraculous event. Alleged "miracles" can never supersede Church teaching. A heretic can be neither pope nor Saint. God has given you the grace to see that. May I ask why you cite 1964 as the year of the Great Apostacy? I thought it was after the death of the Pope in 1958? Thanks. In 1958, the Holy See became vacant, however the hierarchy were not heretics and retained Ordinary Jurisdiction. The first heretical document "Lumen Gentium" which gave birth to the new and heretical ecclesiology was promulgated November 21, 1964. From that day forward, all errors can be traced back to this one. The hierarchy defected at this point when they subscribed to it. I consider 11/21/64 the "birthday" of the Vatican II sect, even though the papacy had been vacant for six years prior. Getting Caught Up In "The Rapture"